We, at ARK Centre, extend our open arms to you in comfort at this time of loss. We wish you and your families in customary and physical terms ‘a long life’ and wish to offer you additional guidance and support through these difficult days. 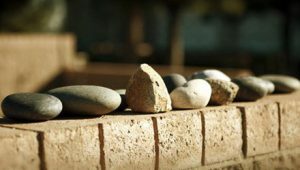 When a loved one has passed away the body, where circumstances allow, should not be left alone. As soon as possible the family or a loved one must notify both the Chevra Kadisha and Rabbi Shneur so arrangements can be made. As soon as it is viable family members, or one person representing the family, meets with the Chevra Kadisha. At that meeting the decisions on time of funeral and minyanim are made. The Chevra Kadisha provides mourners with a Yizkor candle (to be lit upon returning home from the funeral and which remains lit for seven days; the period of Shiva), a book on death and mourning, low chairs (for mourners to sit on during the period of Shiva) and books for minyanim. Rabbi Shneur meets with family member(s) between the time for the funeral is set and the funeral itself. Is the period between death and mourning where Jewish law understands the state of mind of those who have suffered the loss of a loved one whereby they do not have specific responsibilities. The one thing to do is the tearing of a garment which is generally done by a member of the Chevra Kadisha just prior to the funeral. The funeral service is a very solemn and very beautiful one and one where there are almost no decisions to be made by the mourners. In preparation for the funeral Rabbi Shneur meets with family members to talk through the service and identify who will speak at the funeral. The funeral service includes a number of psalms and verses that deal with life and death, consoling the bereaved and blessing the departed. Rabbi Shneur delivers a eulogy that includes his own remarks as well as stories and thoughts the family has shared with him. There is also the opportunity for closest friends / family to share their own stories and memories. Afterwards Rabbi Shneur recites El Male Rachamim, a memorial prayer. At the conclusion of the service in the shtiebel (chapel) members of the family, nominated in advance, assist in taking the departed to his or her final resting place. At the grave site the coffin is lowered into the grave as earth from Israel is sprinkled onto the coffin. Members of the family shovel earth onto the coffin. Care must be taken not to hand the shovel to the next person but rather place it on the ground or in the earth for the next person to take. Once sufficiently full the mourners recite Kaddish. The laws of mourning befall those of first-degree relatives. That is, children, siblings, spouses and parents. Anyone else forms an outer circle of support and comfort. The mourning period differs among mourners. For a parent the mourning period is 12 months. For all others the mourning period is 30 days. Shiva commences from the time of burial. Shiva concludes after 7 days, and during this time the mourners take a complete break from the routine of everyday life and are surrounded by family and friends. Of particular importance is the Kaddish. The Kaddish is a prayer that praises God and expresses a yearning for the establishment of God’s kingdom on earth. 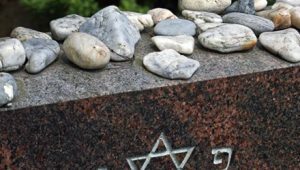 The emotional reactions inspired by the Kaddish come from the circumstances in which it is said: it is recited at funerals and by mourners, and sons are required to say Kaddish for eleven months after the death of a parent. The word Kaddish means sanctification, and the prayer is a sanctification of God’s name. Kaddish is only said in a minyan (prayer quorum of ten men), since the essence of the Kaddish is public sanctification. The one who says Kaddish always stands. It is customary for all the mourners in the congregation to recite Kaddish in unison. A child under the age of thirteen may say the Mourner’s Kaddish if he has lost one of his parents. Most religious authorities allow a daughter to say Kaddish, and at ARK Centre we encourage it (although she is under no religious obligation to do so). The Mourner’s Kaddish is recited for eleven months from the day of the death and also on the yahrzeit (anniversary of a death). A person says Kaddish for anyone whom they sit Shiva for. It is traditional to hold minyanim during the Shiva period. How many depends on the preferences of the family. If a large crowd is expected then the service(s) are done in Shule. A long burning memorial candle should be kindled in your home upon returning from the cemetery and kept burning for the entire 7 days. It is a tradition to cover the mirrors in the house of mourning. Also that the mourner during this period does not shave, cut hair, bathe, or enjoy the comfort of leather shoes. The intent of these customs is to minimise indulgence of vanity and pleasure so that our focus remains with our loved one. During Shabbat, all displays of mourning are suspended. As the mourner resumes their everyday routine, certain mourning practices are continued for a period of thirty days such as not shaving. In the case of a person mourning the passing of a parent, these mourning practices extend for a full year. The timing for the consecration is any time from the conclusion of Shloshim and prior to the first Yahrtzeit (anniversary). Typically the consecration is conducted around 11 months after the burial. 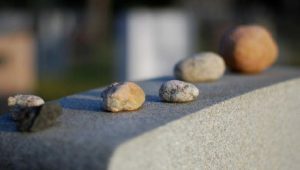 In determining what to engrave on the stone the tradition is to include the name, date of birth and date of death of the deceased in both English and Hebrew and the names and relationships of immediate family in English. The amount of English and Hebrew is, of course, up to each family. The words, or acronym May His/Her Dear Soul Rest In Peace is also often included. Some also like to include a sentence at the top or bottom of the tombstone about the personality or character of the deceased. The Hebrew letters Pay and Noon are also included at the top of the stone as they stand for ‘Po Nitman’, Here Lies Buried. The consecration ceremony is quite short and so Rabbi Shneur encourages a mourner, close family member or friend to say a few words. Rabbi Shneur also speaks and recites El Male Rachamim. The tombstone is read out and the mourners recite Kaddish for the last time until the Yahrzeit. Yahrzeit is first observed 12 months after the Hebrew date that a loved one passed. It is customary that mourners recite Kaddish on the day of the Yahrzeit. In addition members and friends are invited to recite Kaddish on the Shabbat before the Yarhrzeit. For those who wish to there is also the opportunity to sponsor the kiddush on that Shabbat. 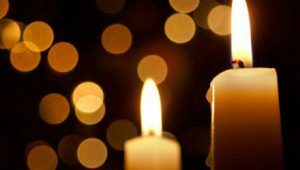 In addition to Yahrzeit there are certain times of the year where there is a Yizkor service during which the departed are remembered and mourned and all those who have a lost a loved on recite Kaddish together. Yizkor services take place on Pesach, Shavuot, Yom Kippur and Simchat Torah.